I recently decided to change the way I collect comics. Instead of trying to get the next hot comic before everyone went bonkers over it, and try to flip it for a profit, I decided to start filling some holes in my collection with comics that I actually wanted instead. I plan on holding onto these comics for the long haul. I finally did it. 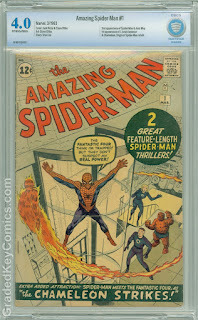 I'd been waiting a long time to pull the trigger on this one, but I finally got a copy of Amazing Spider-Man #1. The hardest part about this buy was convincing myself to spend that kind of money on a comic book. I've bought comics that were near $1000 before, and it was a little rough shelling out that kinda dough, but spending 5x that was a lot harder. Many times I went to right click on Buy it Now, but it was like there was an invisible force preventing my index finger from doing it. I just couldn't press the damn mouse button. Then, right before I left to work one day, I was staring at the copy that I eventually ended up buying (pictured above) on eBay. It was either buy it right then, or keep talking myself out of it, so I said to myself "F#@! it", closed my eyes, and pressed Buy it Now. I quickly paid for it, ran out the door, and went to work. I thought that I would have some buyers remorse after I finally hit the Pay Now button, but I was far more excited to own a piece of comic book history and felt no remorse at all. It seemed like it took forever to arrive, even though it only took a few days. I ended up buying it from the My Comic Shop eBay Store . It was a little cheaper on their website than it was on eBay, but I opted to buy it from eBay for a couple of reasons. First, I couldn't pay for the comic at MyComicShop.com, because the sale price was too high and I couldn't pay for it with Paypal. The second reason, I received $100 in eBay Bucks for my purchase to put towards my next comic investment. 1) It's a very early appearance of my favorite comic book character. It's Spideys second appearance. 2) I couldn't afford the first appearance in Amazing Fantasy #15, unless I bought a beat up, dirt copy that I didn't want. 3) It has great long term investment potential. If you look at the value history of this comic, it doesn't go down, it always goes up. 4) And finally, I just wanted it really, really bad. I figured I had the money for it, so why put it off any longer. Early Spider-Man comics are never a bad investment. I have a few single digit ASM comics, that I will share with you in the future, but I'm now trying to fill in my #1-#20 collection. I've got a few of the more important keys already, but trying to fill the gaps is going to take me a little more time, and a lot more money.